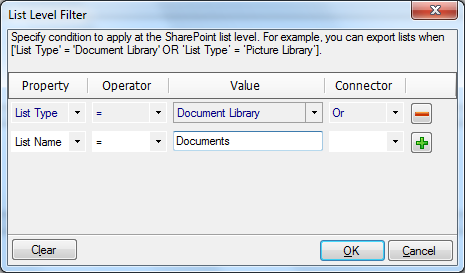 The latest version of the SPListX for SharePoint offers more user friendly features to make it easy to use and quicken the process of exporting content and metadata from SharePoint. Here are some details about these new features and enhancements. The migration tasks can now be grouped together into categories and the Task Manager view has been expanded to provide greater detail about the tasks. The users of SPListX can view the Description, Created Date, Modified Date, Total Items Processed, Total Data Transferred and Settings in a simple tabular view. The export tasks can now be categorized and color coded too. This facilitates users to view only the tasks available in the selected category, as shown in the screenshot below. The users can now choose between Basic and Advanced level filters when defining export conditions to filter contents in SharePoint when exporting them to file shares. The “Basic” level export condition allows users to define conditions based on property values for each level (list / library, folder, document / list item). The “Advanced” level export condition allows users to define slightly more complex queries to export contents. 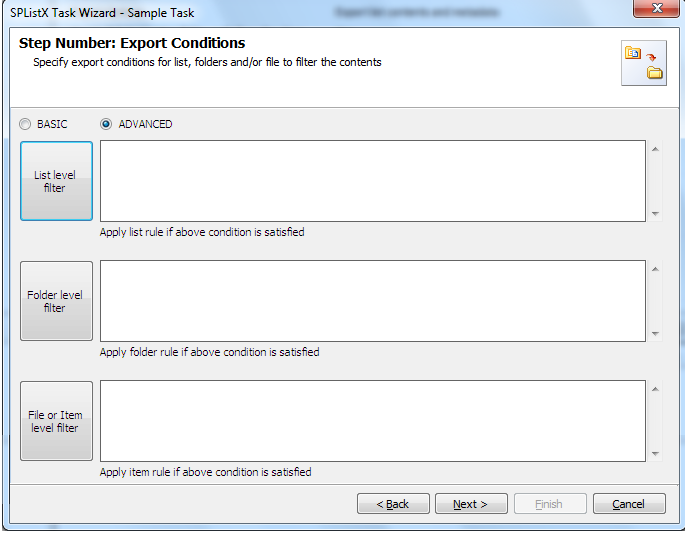 Here is a view of the Export Conditions window showing the Basic and Advanced options that can be selected to refine your export content. The differences between the Basic and Advanced conditions are illustrated below using snapshots from both these operations, using the List level filter as an example. The List level filter is used to filter Lists that are to be exported to file shares. Here is a Basic filter condition set at the List level constructed using the mathematical and logical operators. 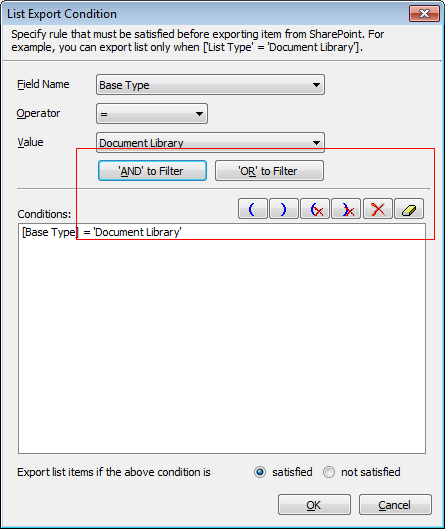 Here is a screenshot of an Advanced filter condition where you can provide nested conditions to fine-tune your filters and export the exact Lists / Libraries you want to export to the file share. Similar choices are available under the Folder level and Item level filters. All these options combined allow you to choose the exact list items or documents that you want to export to the file share. This feature enables users of SPListX to backup or archive select contents to file share.